When it comes to controlling mold growth, your first priority is probably your home’s interior. 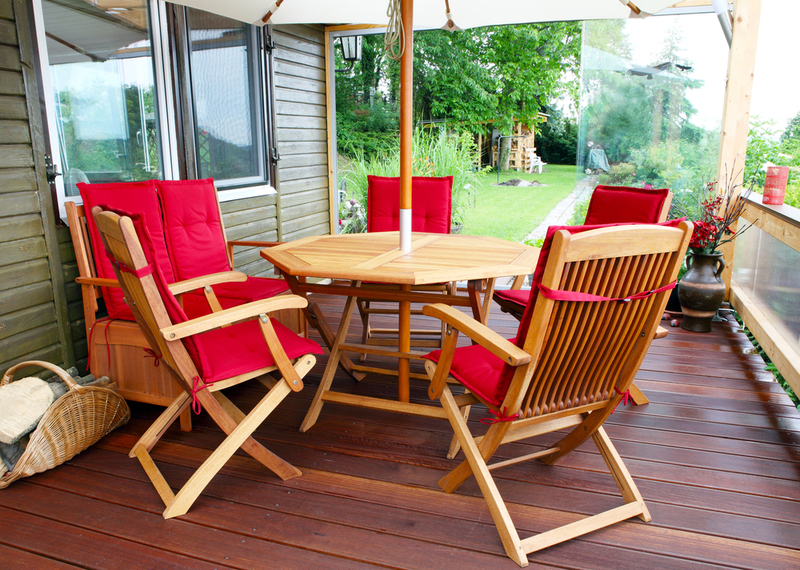 However, if you live in a climate with warm temperatures, high humidity, and frequent rain, you know that mold is more than happy to take up residence on your patio furniture. Consequently, your chairs, tables, and umbrellas will also need regular attention to keep them clean. Ideally you should take steps to prevent mold from forming. But even if you do, no prevention is perfect so it’s wise to stay ahead of mold by frequently inspecting your furniture. You’ll know it’s time to get to work if you begin to notice any of mold’s many forms: black, green, or white spots, or a slick gray or white coating on surfaces. Here’s a four step plan for keeping mold at bay. The fabric of umbrellas, cushions, and rugs is a favorite place for mold to sprout. While no material is completely impervious to mold, some are better than others at resisting its advances. Look for fabrics that are labeled weather-resistant, weather-proof, or waterproof. These are generally synthetic materials like polyester that in addition to being durable are also more mold-resistant than natural fibers like cotton. However, be aware that weather-proofing breaks down with time and repeated use, so you’ll need to be more vigilant as the items age. For fabrics that aren’t naturally water repellent, or items whose protection is wearing thin, there are many spray-on sealants you can find at a hardware or marine supply store. Not only do they help prevent mold, they also repel stains. Always test a product on a small, concealed area to be sure it doesn’t damage or discolor the material. Most of these types of products require two coats for best results. For hard surfaces, spraying on undiluted white vinegar will both clean the surface and help prevent future mold growth. Again, do a small test first. One of the best mold deterrents is also the simplest: a quick wipe down of mold-prone surfaces with a dry, soft cloth on a regular basis. Even though it may not appear that the cloth has picked anything up, it has likely removed mold spores that would erupt into visible colonies if given the chance. While the steps above will give you a tremendous advantage over mold, it’s still a good idea to periodically do a more thorough evaluation and cleaning. Remove cushions, flip chairs and tables over to inspect their underside, take umbrellas down for a closer look… it takes a little time, but it’s worth it in the long run. Get started on a regular mold defense routine today by calling the experts at JMC Contracting, and you and your family can enjoy a summer free of unsightly spots and musty smells.